We’re one step closer to World Heritage status after the visit to the Rideau by an ICOMOS inspector, from September 4 to 8, 2006. ICOMOS, the International Council on Monuments and Sites, is the group charged with evaluating the technical aspects of the Rideau Canal’s nomination for World Heritage status. The inspector, Mr. Michel Cotte, is the Directeur, Institut de l'Homme et de la Technologie, Polytech'Nantes in France. An expert in industrial era technology, Mr. Cotte is also the author of a book about the Canal du Midi, the first (and so far only) canal to be inscribed as a World Heritage Site. This wasn’t Mr. Cotte’s first visit to the Rideau, he was here 12 years ago to attend a symposium, co-sponsored by Friends of the Rideau and Parks Canada, titled “World Heritage Convention – Heritage Transportation Canal Corridors – International Meetings of Experts.” This symposium, held on September 15 to 19, 1994, at Chaffeys Locks (the Opinicon), brought together 16 experts from 10 countries to hammer out a world heritage definition for canals, in order to allow them to be nominated as World Heritage sites. Prior to this meeting, canals could not be nominated as World Heritage sites (there was no category for them). Several FoR directors, including Ed Bebee, Brian Osborne and Ken Watson, had the opportunity to meet Mr. Cotte during his recent visit to the Rideau. He had a very busy itinerary, starting in Ottawa on the 4th and finishing his inspection in Kingston on the 8th (he did have a free day in Ottawa on the 9th to recover from it all before flying back to France). His inspection, was, in a nutshell, to verify that all the nice things that were said about the Rideau in the nomination document (sent to UNESCO in January, 2006), were in fact true. The next stage in the process is for ICOMOS to submit its evaluation of the Rideau’s nomination to the Secretariat of the World Heritage Committee no later than February 2007. As noted in the last newsletter, the Secretariat will confirm that the nomination meets World Heritage criteria and then send it on to the Bureau of the World Heritage Committee who, if they make a positive recommendation, will send it on to the full World Heritage Committee by April/May 2007. The World Heritage Committee will be holding their next annual meeting in Christchurch, New Zealand, from June 23 to July 1, 2007, at which time, if the Rideau nomination is on the table, it will be considered for World Heritage Inscription. This group of fifteen intrepid men and women set out on September 22, 2006, to paddle the Rideau Canal from Ottawa to Kingston. Since Colonel John By built the Rideau Canal as a military route from the Great Lakes to the Ottawa River, it seemed only fitting that a crew made up of alumni, relatives and friends of RMC would undertake the 202 km trip in a 34 foot replica of a Montreal canoe from the days of the fur trade. Their logo is “La Chasse-Galerie,” a witch canoe manned by voyageurs paddling through the sky to their distant homes. The flying canoe appears on the label of Maudite, a strong Quebec beer brewed by Sleeman’s, who have permitted the paddlers to use it as a symbol of their fundraising adventure. The paddlers have raised over $100,000 for an RMC athletic endowment fund, named in honour of Major Danny McLeod, a decorated WWII veteran and an RMC hockey legend. The participants are sharing the costs of the trip. Singing “En Roulant” like the voyageurs of old, the paddlers plan to take a leisurely week to transit the Rideau. Rather than facing portages and a diet of pemmican, the crew were taking advantage of the locks, fine food and accommodation that the Rideau has to offer. Each paddler was assigned a specific task such as cook, bartender, fiddler, or bagpiper and there is even a whale spotter. The crew of La Chasse-Galerie departed from the Ottawa Locks at 8:00 a.m. on Friday, September 22. General John de Chastelain played the pipes from the canoe while Senator Joseph Day took the salute at the National Arts Centre dock. As of this writing (Sept 24), the intrepid crew was last seen paddling (straight into the wind) towards Smiths Falls. At the end of the voyage, the Commandant and cadets of RMC will welcome the canoe with much fanfare when it cruises past the Memorial Arch in Kingston on September 28. In the company of Major Danny McLeod, the crew will attend RMC’s annual Legacy Dinner that evening. The 2006 Annual General Meeting of Friends of the Rideau was held at the Rideau Canal Museum on May 13, 2006. Chair Ed Bebee reviewed the past year’s achievements of Friends. He noted our involvement in the preparations for Rideau 175 including creating the Rideau 175 website, sitting on the planning committee of Parks Canada and producing a promotional Rideau 175/Friends bookmark. Friends also worked with Parks Canada to produce a new brochure titled “Managing Aquatic Vegetation on the Rideau Canal.” Ed indicated that our other brochures such as “How A Lock Works” and “Be Rideau Loon Aware” were very popular and in wide distribution. The Depot, our retail sales outlet and Rideau Interpretive Centre in Merrickville, continues to be very capably run by Dave and Jeanne Brett. Dave’s electric tour boat, the Harriet By, is as popular as ever, getting people out on the water to fully appreciate the Rideau. Ed reported that Jo MacFadden was very busy working on developing Canada’s Rideau, a proposed TV special program. Ed noted that Nancy Lake efficiently manages our office at 1 Jasper Avenue in Smiths Falls – maintaining our accounts, our mail-order sales and fielding all sorts of questions. Ed commented on our involvement with several Rideau oriented committees including the Rideau Heritage Network and the Rideau Canal Advisory Committee. Ed also reported that two FoR directors had released new books in the past year, Ed’s own “Pathfinders, The Guides of the Rideau” and Ken Watson’s “Engineered Landscapes, The Rideau Canal’s Transformation of a Wilderness Waterway.” Both of these books provide fascinating new insights into the rich history and heritage of the Rideau Canal. Ed also gave a special thank-you to our official liaison with Parks Canada, Mary Ann Stienberg, for all the help and support she has provided to our organization. At the conclusion of business (the financial report, minutes of the last AGM and the election of directors), Ed introduced the first speaker, Gavin Liddy, the new Superintendent of the Rideau Canal. Gavin reviewed his background and spoke about Parks Canada’s mandate to foster public appreciation of Canada’s parks, noting that Parks was one of the first conservation authorities in the world. Parks partners with other organizations such as Friends of the Rideau, and Friends is a valued partner, which is why Gavin was at the AGM. Gavin reviewed the submission of the Rideau Canal’s nomination to be declared a World Heritage site, submitted to UNESCO in January, 2006. He also spoke about the upcoming celebrations in 2007 for Rideau 175 and how Parks Canada can partner with communities along the Canal to promote the event. The second speaker was Brian Osborne, Professor Emeritus of Geography at Queen’s University. Brian provided a fascinating, sweeping talk about the Rideau’s past, present and possible future. His ideas about where the Rideau has been and where it is headed prompted a number of thoughtful exchanges with the audience. 2006-2007 FoR Executive and Directors Chair: Ed Bebee; Vice-Chair: Vacant; Treasurer: Dave Edwards; Secretary: Sheilagh Dubois. Directors: Dave Brett, Jeanne Brett, Dave Freeman, Mark King, Josephine MacFadden, Brian Osborne, Ken Watson. Shortly, the 2006 boating season on the Rideau Canal will come to a close. All along the waterway the leaves have started to change colour and, in areas where there was little rain in August, have started to fall. The geese have begun their fall migration, the hummingbirds have deserted their feeders and only an occasional monarch butterfly still glides gently on the cool fall breeze. Nature is preparing for the winter ahead. However, plans for next year’s 175th celebration of the opening of the canal are in full swing. Parks Canada will host a birthday bash on June 30, 2007 between 10:00 a.m. and 4:00 p.m. at the Ottawa Locks. Admission is free. We’ll provide you with details about the program when they are available. Communities from one end of the canal to the other are also looking forward to including their fairs and festivities under the Rideau 175 umbrella. Friends of the Rideau has published a bookmark to promote both Rideau 175 and Friends of the Rideau. Parks stocked these at lock stations and Friends has distributed them to various library systems along the waterway. In fact, the bookmark has been so popular that more are now being printed. In preparation for next year, Friends is working with the organizers of a writers’ festival that is slated to take place at Jones Falls during the summer of 2007. Friends will assist with the logistics and promotion of the festival. If you are interested in working on this festival or have suggestions for other projects Friends could undertake for Rideau 175, please contact Sheilagh Dubois at sheilagh1@sympatico.ca or by phone at 613-387-2975. Josephine MacFadden is very pleased to announce that the Canada Revenue Agency has approved an Agreement between Friends and her film company, Communicado, which will make it possible for Friends to accept contributions to the TV special program Canada’s Rideau and give contributors a receipt for tax purposes. Canada’s Rideau is a proposed hour-long documentary-drama telling the history of the Rideau Canal. Friends has been assisting with the development of this special program and the first draft script is now ready. Filming is planned to start this fall. Winter construction scenes will be shot with snow on the ground and the rest will be filmed in the spring when the leaves return. The World Premiere of Canada’s Rideau is planned for late Fall, 2007, as a special celebration of the anticipated UNESCO World Heritage Site designation of the Rideau as well as for Rideau 175. The Governor General has been asked to host this exciting event at Rideau Hall. International press will be invited to bring this story to the screens of the world. Canada’s Rideau producer Jo MacFadden has been working with writer / director Greg Hancock on the script. The story is told through the words of all the builders from the Duke of Wellington who send Colonel By to build the Rideau Canal, to the French and Irish labourers. The program portrays so many aspects of our magnificent waterway: the wilderness setting, political intrigue, financial problems, engineering and construction triumphs, personal loyalties and betrayals, suffering and death through accidents and illness . . . Shortly, Friends and Communicado will issue a Press Release about the program and invite financial contributions to the production. A new Sponsorship Package is available and any interested contributors should contact Nancy Lake at the Friends office, or Jo MacFadden at macfadjp@magma.ca. Meetings with sponsors and contributors will be held and many other organizations and individuals are offering to assist with this fundraising. Meetings with Rideau Corridor stakeholders have begun, bringing offers of help and support with fundraising and filming which is most gratifying. Canadian broadcasters are already lined up. Producers will attend the 2006 World History Congress in London, England to continue the international marketing which began at the Toronto conference in 2004 at which PBS and BBC, among others, showed interest in broadcasting this very special program. Please help Friends to bring Canada’s Rideau to the screens of the world. For further information, please contact Jo MacFadden at macfadjp@magma.ca or Nancy Lake at 613-283-5810. A look at the cumulative lockage statistics to the end of August shows that vessel traffic is down over 2005 numbers. To the end of August 2006 there were 62,902 vessel passages – a 9.7% drop from 2005. Moorings were down 12% when compared to 2005. 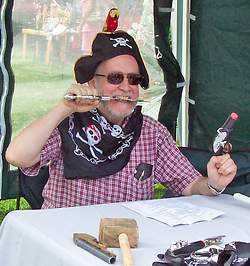 In terms of boat origin, 63.4% of the boats were from Ontario, 24.4% from Quebec and 11.9% from the U.S.A.
Captain Greybeard then stepped up to presiding Judge – Pirate Ed (Ed Bebee), who was sporting a dashing pirate hat, necktie, parrot, pistol, and “faithful to the period” sunglasses. Captain Greybeard first apologized to Judge Ed that the defence council would be somewhat delayed due to his unfortunate drowning in the lock late on the previous evening. Captain Greybeard then presented his main legal argument, a bag of gold coins, to Judge Ed. There was a brief pause while waiting for the absent defence council to offer a weightier counter argument to the Judge. There being none, the defendant, Mayor Struthers, was asked to speak in his own defence. However, Mayor Struthers’ first words were drowned out as the Judge’s gavel hammered down and the words “You have been found GUILTY of all charges” rang out across the commons. The mayor’s wife, Andrea, pleaded to the Judge for clemency, asking, that at the very least, Doug’s ball and chain be removed before he was made to walk the plank. The Judge, with some compassion, offered Mayor Struthers the choice of which “ball and chain” he wished to have removed. The Mayor was last seen sinking into the depths of the Rideau Canal. The picture is of Benjamin Bennett Sayer (hatless) with a bewhiskered Battersea guide (name unknown). The “bragging pole” shows a summer day’s catch around the turn of the 20th century. As a fisherman, it’s easy to see why Mr. Sayer enjoyed coming to Battersea with his family. The water around Battersea – Dog Lake, Crane’s Nest, and Loughborough Lake – teemed with fish. But like many idyllic situations, there’s a story behind the picture. An 1878 map of Battersea shows a summer hotel, and a certain Captain Nanny is generally regarded as one of the first regular summer visitors to the area. Benjamin Bennett Sayer, a young acquaintance of the Captain, had suffered multiple broken bones falling from an apple tree in the Sayer family orchard in Warwick, NY. Seeing the gravity of the situation, so to speak, the Captain brought Benjamin up with him for the summer. The recuperative powers of the Canadian air, water and beer are legendary. Benjamin’s recovery was hastened by meeting Anne Waggoner of Inverary at a barn dance, falling in love and marrying her in March 1894. When the Sayer family came to Battersea for the summer– husband, wife, three children and family servants, it was a major campaign – it took days. The first leg of the journey began by stuffing clothes, food, and summer equipment, along with themselves, onto the stage from Warwick to Newburgh. There they transferred everything and everyone on board a train. Eventually they rattled into Kingston. They then repeated the tedious baggage transfer process and clambered on the stage to Battersea. On the last leg, everything was then shipped via boat to Big Island, often in the dark of evening. The Sayers took over Big Island for the summer – in tents. Faced with all this, what was a man to do? 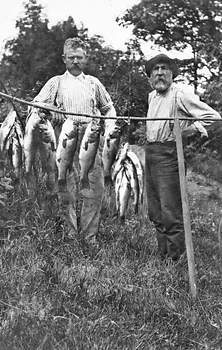 Well, Benjamin Bennett Sayer was clearly equal to the challenge – he went fishing. Recently I listened to a story of going on vacation with two young girls – packing, keeping them fed and watered, amused, and above all, quiet. All of this took place in a modern minivan, on modern highways, and on jaunts of less than 4 hours. The books and DVDs were never enough. While I murmured my sympathy to the beleaguered parents, I thought I heard the spirit of Mrs. Anne Sayer chuckling in derision. A common jingle has it that “History is about chaps; Geography is about maps!” Well, as an historical geographer, I like them both. So you can imagine my excitement when Heather Home at Queen’s University Archives (QUA) introduced me to a mini-collection of eight maps, diagrams, and reports produced by one of my favourite “chaps,” John By. No. 4. Plan of the Works at Kingston Mills Rideau Canal” by Lt Col By Com. Roy Engineer, 22 January 1831. Queen’s University Archives. 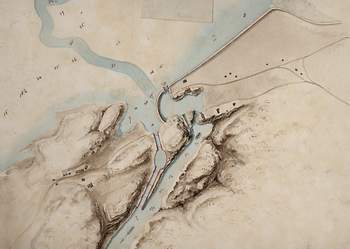 This map shows the proposed locks at Kingston Mills plus the surrounding topography, including the original channel of the Cataraqui River. The numbers on the maps are Colonel By’s estimates of the flooding depths once the dams and berms were raised to their full height. One of the maps is entitled, “No. 4. Plan of the Works at Kingston Mills Rideau Canal” by “Lt Col By Com. Roy Engineer.” Of course, this item did not escape the attention of Joan Winearls’ magisterial work, Mapping Upper Canada, 1789-1867 (Toronto: UTP 1991). Her entry 518 (p. 143) identifies this item as one of a series dated 22 January 1831, entitled “Plans of the state on the Rideau Canal” which – except for this Kingston sheet – are located in the National Map Collection (NMC), and the Ontario Archives (OA). It is a beautiful map, bordering on landscape art in its rendering of a hachured topography, dams and locks, and roads and houses as they existed at that time. Another element underscores By’s preoccupation with costs. Reporting on the monies needed to complete the works and the monies expended to 30 December 1830, he declared that he had £13,188–6 shillings–10¼ pence in hand: yes, right down to shillings, pence and farthings! This mini-collection of By material at Queen’s also has some other interesting drawings: “The Woodwork of the Face Sluices Jones Falls & Kingston Mills,” “Plan of Section of Waste Weir Gate, Brewers Upper Mills,” “Plan & Section of Face Sluices Jones Falls & Kingston Mills.” They too underscore the blend between art and functionality that was so essential for the nineteenth century engineer. All in all, this “little By collection” at the Queen’s Archives adds nothing new to our understanding of the Rideau works, but it underscores the usual sub-themes of the story: Herculean works; penny-pinching finances; disease and death; and a bureaucratic thoroughness that left behind so much detail. 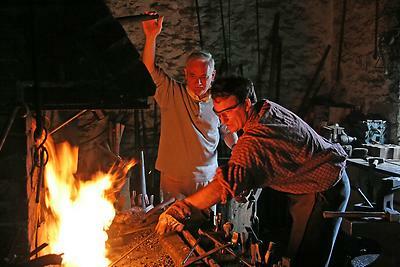 Like the metal machinery and stone masonry, the paper trail endures as another remarkable achievement of Colonel By and his staff.